High-intensity interval training, or HIIT, has become exceptionally popular in recent years, but researchers have known of its benefits for a long time. It provides incredible results with short workouts, so it's ideal for people who want to challenge themselves but don't have much time to dedicate to exercise. For martial artists, this type of training is essential as this is how energy is expended during competition or hard sparring---hard short bursts. There are a wide variety of high-intensity interval workouts you can try, but one popular option is to use a treadmill. Before starting any new exercise program, though, you should understand how and why it works as well as what equipment will best help you reach your goals. High-intensity interval training is a workout style that alternates between periods of high intensity and periods of low intensity or rest. For example, running up a flight of stairs, walking down, and running up again is a form of HIIT. Alternating between sprinting on a treadmill for 30 seconds and walking for two minutes is also a great high-intensity interval exercise. The exact length of the high-intensity exercises and the periods of rest can vary. In most cases, the high-intensity activity lasts for 20 to 30 seconds, and the rest lasts for 15 to 30 seconds. These workouts can usually be completed in less than 30 minutes, but they're more effective than longer sessions of moderate cardio. Your target heart rate during high-intensity interval training is 80 to 95 percent of your maximum heart rate, which you can calculate by subtracting your age from 220. Certain health conditions can make it dangerous to increase your heart rate so much, so you should speak to your doctor before starting an intense exercise regimen. HIIT helps your body burn a significant number of calories without spending much time exercising. During the periods of rest or low intensity, your heart rate is still elevated, and your body is still burning calories. You'll also continue to burn lots of calories after the workout because HIIT increases your metabolic rate for several hours. It can be an effective way to lose fat, especially for people who have a limited amount of time in their day to exercise. HIIT can improve your oxygen consumption as well, which gives your muscles more energy during workouts. One study found that participants who completed an eight-week HIIT program that involved 20 minutes of exercise three times per week had a 25 percent increase in oxygen consumption. Some treadmills are better suited to high-intensity interval workouts than others, and there are certain qualities you should look for in a treadmill if you're interested in HIIT. Because you'll need to run fast during the high-intensity bursts, your treadmill should be able to reach speeds greater than 8 miles per hour. Running at an incline is also a popular way to increase your heart rate during high-intensity treadmill workouts, so you should look for a treadmill that allows for an incline of more than 10 percent. Safety is one of the most important considerations when choosing a treadmill for high-intensity workouts. Because you'll be running so quickly, your treadmill's deck should be long and wide enough to safely accommodate your full stride. Your treadmill should also have stable side rails, especially if you plan to transition from high-intensity activity to rest by hopping off the running belt onto the rails. The rails should be at least four inches wide and should have good traction, which will help you jump onto them without slipping. The ProForm 705 CST is popular for high-intensity interval training because it can reach a speed of 12 miles per hour and an incline of 12 percent. The tread belt is 20 inches by 60 inches, so you can sprint safely without worrying about falling off the machine. The treadmill comes with 22 preset workout apps, so you can choose the mode that best matches your fitness goals. It has a weight capacity of 325 pounds. 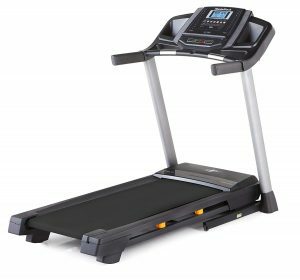 The ProForm 705 CST uses a 2.75 CHP motor, which is slightly less powerful than most treadmills designed for running or sprinting. Depending on how frequently you do high-intensity interval training on the treadmill, you may have to replace the motor sooner than is ideal. Users love the technological capabilities of this treadmill. It has a heart rate monitor within the handlebars, so you can see whether you're close to your target heart rate. It also can connect via Bluetooth to the iFit Coach smartphone app, which offers a variety of workout programs. 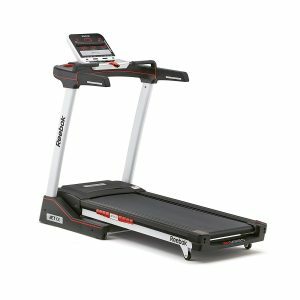 The 3G Cardio 80i Fold Flat treadmill is designed specifically for runners, so it has all of the features you need for high-intensity interval training. You can reach speeds of 11 miles per hour and an incline of 15 percent, so you can increase your heart rate while also strengthening the muscles in your lower body. 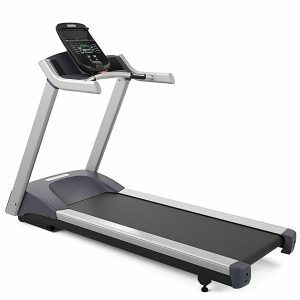 The treadmill has a 58-inch belt and a 3.0 HP motor, and it uses quick speed and incline controls to let you easily change your settings while running. The frame is strong and durable to withstand impact. The treadmill has a weight capacity of 350 pounds. Like its name suggests, the treadmill can fold flat and can easily be stored under your bed to save space. You can also fold it vertically and store it against your wall or in a closet. 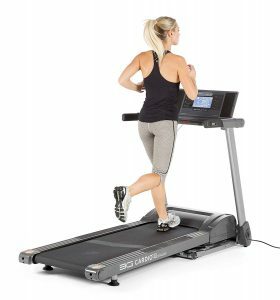 The biggest complaint users have is that the console doesn't offer as many features as other treadmills do, but this doesn't affect the treadmill's performance. We choose the 3G Cardio 80i treadmill as the Editor's Choice because it combines its space-saving design with a powerful motor, adequate max speed of 11mph, and steep incline of 15% all in one functional, affordable, and convenient machine. 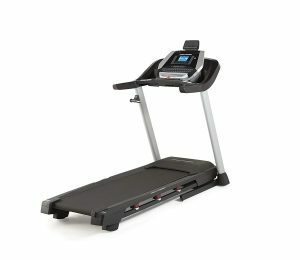 The NordicTrack T 6.5 S treadmill can reach a maximum speed of 12 miles per hour and an incline of 12 percent. It has a shock-absorption system with cushioning that users can turn on or off, which is great for people who need more joint support. You can use the built-in heart rate monitoring system to determine the intensity of your workout. The treadmill also comes equipped with 20 workout programs and is compatible with the iFit app, which offers hundreds of other programs. It has a 2.6 HP motor and a weight capacity of 300 pounds. The running belt is 55 inches long, so it may be slightly too short for taller people who are planning on using the treadmill for sprinting. Some users have also noticed that the motor can get loud, so the NordicTrack may not be the best option for people who are concerned about noise. The Precor TRM 243 is one of the highest-quality treadmills on the market for high-intensity interval training. Its maximum speed is 12 miles per hour, and it can reach an incline of 15 percent. It comes with 39 pre-programmed workouts, so your training sessions will never get boring. The treadmill uses a shock absorption system that allows the running deck to conform to your own unique stride, so it will deliver extra support to the areas of the deck where you make the most impact. It uses a powerful 3.0 HP motor and has a weight limit of 300 pounds. The running deck is 20 inches by 57 inches. Most people will find that this is plenty of space, but taller individuals may need to look for a treadmill that has a longer running deck. The handlebars are also quite short, which can make hopping onto the side rails difficult during interval training. The Reebok Jet 100 is one of the highest-rated mid-range treadmills. It uses Reebok's Air Motion cushioning technology, which reduces the stress on your joints while you run. Its console comes with 24 workout programs, and the treadmill has 12 different incline settings with a maximum incline of 12 percent. It reaches a top speed of 10 miles per hour, and it has a built-in cooling fan to help you stay comfortable during your workout. The Reebok Jet 100 is on the smaller side with a running belt that's 51 inches by 17 inches. It uses a 2.0 CHP motor and has a weight capacity of 240 pounds. Because of these limitations, the treadmill is ideal for shorter or smaller people, but taller or heavier people might find it lacking in size and power. Experienced runners may also want a treadmill that reaches speeds greater than 10 miles per hour.